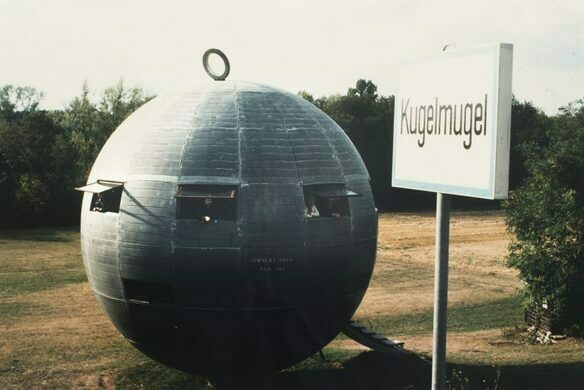 The Republic of Kugelmugel (roughly, “spherical hill”) was originally constructed by the artist Edwin Lipburger and his son Nikolaus Lipburger in 1971, in a small Austrian town called Katzelsdorf. 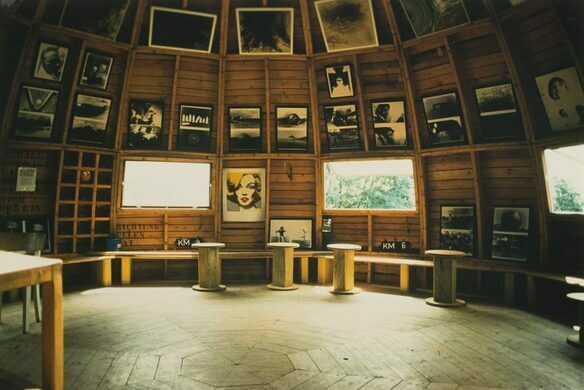 The building has 7.68 m in diameter and is constructed of timber blocks covered with zinc sheets. At first, it served as a painter’s atelier. But after some time local authorities informed the Lipburgers that spherical buildings were not allowed. 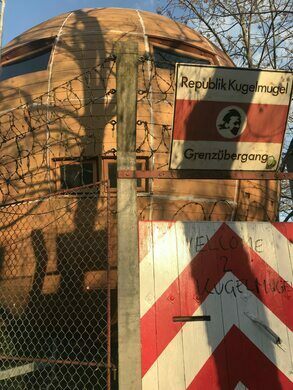 In an attempt to protect their creation from being demolished, the Lipburgers created their own Kugelmugel township, complete with self-made street signs surrounding the sphere. Later, as the legal dispute escalated, Edwin Lipburger attempted to declare the structure as its own federal state, the Republic of Kugelmugel, even going so far as to issue his own stamps and currency and refusing to pay taxes. The elder Lipburger was eventually sent to jail, for 10 weeks in 1979, for the offense of putting up unapproved street signs. 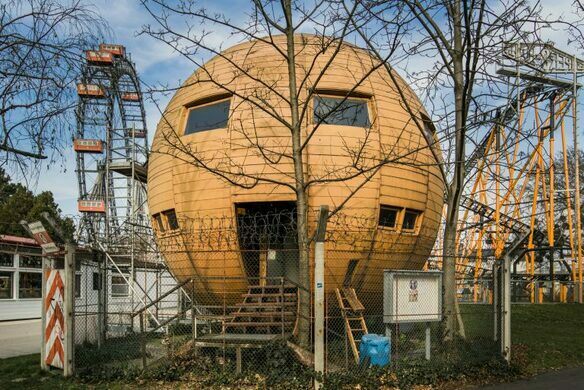 The key to understanding Kugelmugel is that it was founded as a “republic” both as an artistic intervention and in order to protect the spherical house from being demolished. As an act of resistance, it earned quite a few fans. In the early 1980s, Austria’s culture minister, Helmuth Zilk, suggested Kugelmugel be moved to the Vienna Prater amusement park. The Lipburgers went along with the idea, having been promised access to tap water, electricity, and sewers. But these facilities were never provided, which resulted in a long-lasting dispute with the city of Vienna. Edwin Lipburger died in 2015, but Kugelmugel still sits in Vienna Prater, enclosed in barbed wire. A proud “micronation,” it counts about 600 people as citizens, though their citizenship is enjoyed from afar. Kugelmugel is located in Vienna's famous Prater park. Today it is mostly a gallery space that's open to the public for exhibitions and performances several times a year. Micro-nation based around a nine-story high illegally built tower.